The Jacksons of Loonburn, Co. Antrim are connected to the JACKSONs of Steeple, Co. Antrim. Part of my work this spring will be figuring out how they connect. NOTE: I have included some Islandmagee JACKSONs because they are descendants of the Loonburn and likely of the Steeple JACKSONs and hence will turn out to be pertinent. See also Timeline of JACKSONs of Steeple. 11 June 1771 On Friday last died suddenly, Mr. James Jackson of Loonburn. Lease of 167 acres 3r. 39 per. I.P.M. for 61 years from 1 November 1804 - Rent: £28 p.a. plus fees of Most Hon. George Augustus Marquess of Donegall to George Jackson, Loonburn, Co. Antrim relating to Loonburn (Lisnalisk), Co. Antrim. Lease of Loonburn, Co. Antrim from Marquis of Donegall to George Jackson, Lisburn, Co. Antrim. Btw Luke JACKSON of Loonburn. Co Antrim Farmer of 1 pt & James ARMSTRONG of Artnagullion Co Antrim farmer lease for one year of Lisnalisk called Loonburn abt 19A… bounded on south by lands of Ballybracken on the east by George JACKSON’s land in Parish of Donegore, Barony of Antrim, Co Antrim… lives of Martha ARMSTRONG daughter of James ARMSTRONG of Artnagullion, about seven years, John ARMSTRONG son of said James abt 4 years and Mary Black JACKSON daughter of George JACKSON of Lisnalisk aged abt 1 year. Conveyance of the farm of Loonburn in Lisnalisk, Co. Antrim, containing 83A 3R 39P I.P.M. demised by the Marquess of Donegall to Jackson by lease dated 1 April 1828, for three lives renewable forever, at the yearly rent of £13.0.9½. Lives: Martha and John Armstrong of Artnagullion, [NOTE: A Matty JACKSON was married to a William ARMSTRONG. Their son James was born 1833] Mary B. Jackson, daughter of lessor. Consideration: £80. Luke Jackson, Loonburn, Co. Antrim to James Armstrong, Artnagullion, Co. Antrim. A retired Farmer, never married. He was boarding with William & Susan DAVIDSON. Luke JACKSON effects under £3,000 late of Ballymena Co. Antrim, Gent d 12 Dec 1858 at Ballymena proved by Mary JACKSON of Ballymena, widow & George Alexander JACKSON of Islandmagee and John ARMSTRONG of Artnagullion, farmers & executors. NOTE: The land at Loonburn was bequeathed to his brother George A. JACKSON and thence to his son George JACKSON (b1850). His wife was Mary ELLISON, and it seems they had no children. Loonburn had no substantial buildings. George Jackson had title to about 170 of the 286 acres in the townland. He likely sub-leased to tenant farmers. He also leased 40 acres directly from the Marquis of Donegal. This is most likely George Alexander JACKSON (1804-1877) who was deeded the land after the death of his brother, Luke JACKSON (-1858). Conveyance of the lands of Loonburn, Lisnalisk, Co. Antrim. Chancery Division, estate of Geo. A. Jackson to James Hollinger, Loonburn, Co. Antrim. NOTE: He was possibly born 1804, and married Jane TWEED. Probate of the Will of Robert Jackson late of Carnspindle Islandmagee County Antrim Farmer who died 8 July 1907 granted at Belfast to George Alexander Jackson and Luke Jackson Farmer." Probate of the will of Luke Jackson late of 29 Agincourt Ave., Belfast Farmer (retired) who died 31 May 1909 at The Moat, Islandmagee Co. Antrim granted at Belfast to George Alexander Jackson Farmer. Effects £1,223 3s 8d. He is Likely related to the family in the Dean Family Tree. – possibly a brother of George Alexander JACKSON. Land Purchase Commission, Northern Ireland. Northern Land Act 1925. Estate of Wilhelmina Trelford Jackson, Georgina Alexander Jackson and Jane Tweed Browne (wife of Edward William Browne): townland of Loonburn, barony of Upper Antrim, Co Antrim. The tenants held leases to a 30 acre parcel and a 61 acre parcel. NOTE: It is likely there was a familial link to 2 of the tenants on the 13 acre parcel: James Crothers & Holmes Jackson Crothers. 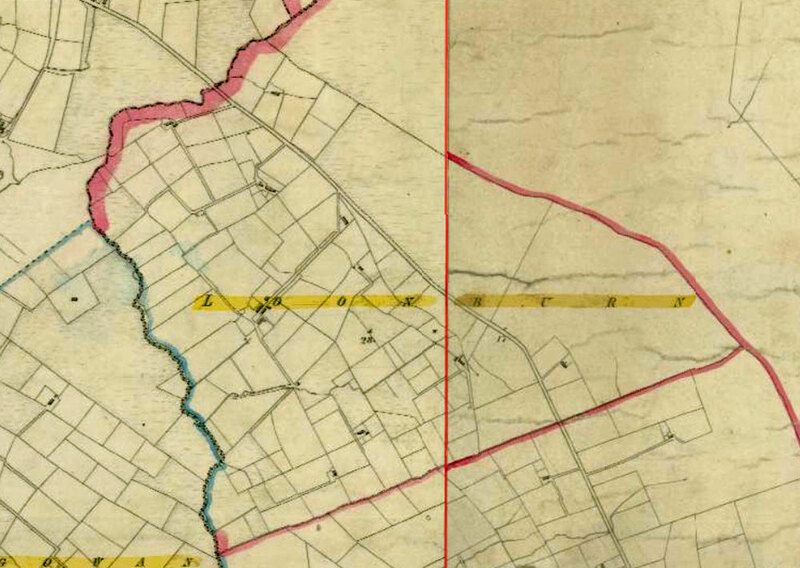 Estate of Wilhelmina Trelford Jackson, Georgina Alexander Jackson and Jane Tweed Browne (wife of Edward William Browne): townland of Loonburn, barony of Upper Antrim, Co Antrim. · Margaret Bryson (widow): 61 acres.